At 19 years old, Sean Gunther decided to make a dramatic life change. One year later…150 pounds lighter, he shares his inspirational story! I’ve been told that I did not develop a weight problem until I started school. I was a slow eater and the school was upset because I took too long at lunch. They made me eat faster. This caused me to eat more and that coupled with a semi-poor diet led to the beginning of my problems. I went to a fat loss camp in 6th grade and lost 15 lbs. I managed to keep it off until high school. It got worse as I worked in restaurant after restaurant. Fast food places became havens. I remember before work, I would buy 2 McChickens, a McDouble, and a snack wrap. THEN I would eat later that night as well. Dinner would usually include a steak sandwich and cookies. I had always been athletic, so most people told me I was just a big guy. I knew I was obese, but I did not want to change the lifestyle I had grown accustomed to. I would play basketball every other day, so I was not lethargic. I had also researched nutrition my entire life, so I knew why I was obese. Like many big people though, I made it into a joke. I had been trying to lose the weight most of my life. When I finally made the decision I was 19 years old. My girlfriend at the time had started to lose weight and I felt inspired to follow suit. My clothes were no longer fitting, and I was just always unhappy. I will never forget the moment that I made my decision. I was working at a gas station at the time and my diet consisted mainly of pizza, Little Debby cakes, candy bars and turkey pot pies. I stepped on the scale for the first time in over 2 months and it read 350. I just stood there in shock and shame. It was the beginning of February. I lost 10 lbs, then regained that weight back by the end of February. Finally I just stared at myself in the mirror. It was one of those moments you see in the movies. I gained a type of epiphany. I did not even realize how big I had become. 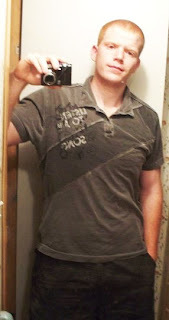 I was used to the “fat guy” moniker I had earned in my life. I was working at a gas station and had just moved in with my roommates. We played video games all day when we had the day off and just hung out at night. I did not drink a lot of soda but I would fill up a 32 fl oz bottle with coffee every night. I could drink 2 or 3 bottles a night. I was actively playing basketball and other sports until December, then I just stopped. I guess, in a way, I knew in the back of my head I was always a joke to most people. It really hurt my self esteem. When I would go out with friends and they would whistle at girls, I would just hang my head and keep quiet. The plan I created was a work in progress for the last 15 years. Ever since I had been big, I read up on how to lose weight. I have a box full of health magazines and I have read every article in each one. I also read stories and articles online. When I went to fat loss camp, I took extensive notes. I had tried every diet as well. I tried restricted calories, Atkins, Southbeach, Zone, etc… and although they worked, it was too strict for me to stick to. My opinion was these diets made dieting too difficult. Weight loss at its core is a basic math equation. The first thing I did was find out my Basic Metabolic Rate (BMR). Your BMR is approximately how many calories your body burns to maintain your weight. At 6’0 350 lbs, a male can consume 3000 calories and maintain that weight. I decided to eat around 1700-1800 calories a day. This created a minimum of a 1200 calorie deficit. A pound of fat contains 3500 calories. In a week I would burn off 2.5 pounds of fat from diet alone, but with my exercise plan I was losing about a pound a day. 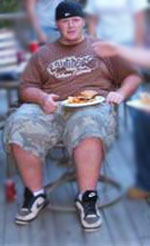 When I was 350 lbs, I could not go running because of the stress on my knees. I had to use elastic bands. Now a lot of people told me they walked for 30-45 minutes a day when they started losing weight, which is great! I just didn’t have the time to dedicate to that. My workout was around 5-10 minutes long. I would do arm flys, curls, tricep extension, squats, and abs. I would do exercise with no break (Circuit training) and I started with 3 sets. Eventually I moved up to 5 sets. The important thing was to do it before I ate. It jump started my metabolism after fasting for 6-8 hours. When I ate breakfast it increased my metabolism as well, since I had already begun moving. This usually consisted of eggs or cereal, oatmeal, and low fat milk. I avoided a lot of simple carbohydrates in the morning. Grains were perfect in the morning because I needed the energy. I avoided pancake batter and sugar because they are high in sugar. They raise your blood sugar, which will raise your insulin, which will cause you to retain fat! I tried to make sure I had low sugar cereal. I started reading ingredient labels. If the first few ingredients included sugar, oil, or high fructose corn syrup, then I passed on the cereal. Since I play sports and lift weights, I liked having protein for breakfast. I ate egg whites to avoid the cholesterol in eggs but occasionally ate eggs. I would eat high fiber oatmeal (with water added in) so that I would feel full longer, and then a glass of skim milk. I also knew that eating 5 times a day was better than 3 large meals, so I incorporated snacks. When I ate a snack depended on how hungry I was. If I was hungry 2 hours after breakfast, I would eat. If I was busy and didn’t get a chance to snack until 2 PM, then so be it. Snack -A granola bar (200 calories). The only thing important was choosing snacks that were low in sugar, preferably high in protein, low fat and not highly processed. Grilled chicken with doritos. Yes, that’s right, doritos. I ate doritos for the first month of my diet because I still was addicted to junk food. It is all about moderation. I ate slower and enjoyed the food. The doritos at mid day kept me motivated to eat healthy because as long as I knew I was doing good, I could have them. I ate a lot of frozen meals to learn portion control but the sodium was really high. So although not the healthiest route, it worked. A typical meal was 250 calories plus the doritos which were 150 calories, so a total of 400 calories. Here was my secret and I follow this to today. I ALWAYS had a dessert at night. I love sugar. Always have and always will. Limiting my sugar intake was hard all day and at the end of the day I wanted something to indulge in. Now, most people recommend to do this one day of the week but that did not work for me. I worked hard all day to eat healthy, I deserved a treat! A typical treat was a york mint at first, but slowly I moved to lower calorie and lower sugar treats. The point was to enjoy myself! Once a week, I would pick something I wanted to eat, and just eat it. If I was craving cheesy bacon fries, I would go and eat them. Then the rest of the week, I would stick to my diet. I don’t believe the challenge ever truly “ends”. I took it upon myself to become healthy and I live with the choices I make every day. It is changing, however. Now instead of losing weight, I am working towards being more athletic. It was frustrating some times when people would want to go out and eat and I could not go because it was not my “cheat” day. It was also frustrating that my healthy food would cost twice as much and working at a gas station does not pay that well. However, my roommates have great metabolisms so the food they bought was not what I wanted to eat for my diet. Overall though most people were supportive, so I always had motivation. My mom was and is definitely my biggest fan and supporter. She always knew how to inspire me and keep me going when I wanted to just stop dieting or I had a bad cheat day. She would just remind me that one day does not sabotage a week. I think what truly inspired me though was that she really was concerned for my health. Diabetes runs in our family and she was scared that I was going to be diagnosed with it and always tactfully brought up how I should lose weight. Now that I have, she is more proud than ever. I love the fact I made her proud as well as being able to take pride in myself. I look back at how far I have come since March 2009. It seems like such a short time ago, but in one year I have completely changed my life. In a way, however, it has shown me more than any other experience that life is forever changing. If there is something in your life that you want to change, you always can. I am more comfortable with myself, I like to look in the mirror, I like to buy clothes, and most of all I like to go and be with people. I am no longer embarrassed to be seen going out to eat. I am truly enjoying life for the first time in a long time. I am also helping people at work eat healthier and live a healthier lifestyle. That makes me feel even better. I am working at Harrah’s Casino right now cleaning tables. Nothing glorious but it is a step in the right direction. I plan on getting my MBA (Masters in Business Administration) with a focus in marketing and possibly a minor in economics. I plan on working at Harrahs and eventually applying for a business internship within the company. I am going back to school in the fall to earn my Associate of Arts College Transfer, then will probably attend UNC Asheville. I am also (hopefully) going to become a certified personal trainer by the end of this summer. As a trainer, I hope to help people with their own challenges and learn to see the world through their eyes. I will continue to challenge myself, also. Next up for me…I’m going to become a vegetarian for a month. As a chicken lover, that may be tough but as you can see…I love a challenge!